represents a normal (Gaussian) distribution with mean μ and standard deviation σ.
represents a normal distribution with zero mean and unit standard deviation. NormalDistribution allows μ to be any real number and σ to be any positive real number. NormalDistribution[μ,σ] represents the so-called "normal" statistical distribution that is defined over the real numbers. The distribution is parametrized by a real number μ and a positive real number σ, where μ is the mean of the distribution, σ is known as the standard deviation, and σ2 is known as the variance. The probability density function (PDF) of a normal distribution is unimodal, with the peak occurring at the mean , and the parameter σ determines both the height of the PDF and the "thickness" of its tails. The PDF of a normal distribution is symmetric about its maximum, and the tails of its PDF are "thin" in the sense that the PDF decreases exponentially for large values of . (This behavior can be made quantitatively precise by analyzing the SurvivalFunction of the distribution.) The zero-argument form NormalDistribution is equivalent to NormalDistribution[0,1] and is sometimes called the standard normal distribution. Due to the presence of the Gaussian function in its PDF, a normal distribution is sometimes referred to as a Gaussian distribution. 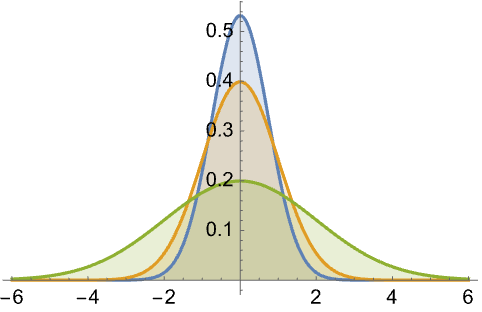 Informally, a normal distribution may also be referred to as a "bell curve" as a result of the bell-like shape of its PDF. However, it should be noted that other distributions such as CauchyDistribution, StudentTDistribution, and LogisticDistribution also display qualitatively similar "bell" shapes. Random variables that are normally distributed are sometimes called normal variates, and the standard normal distribution may also be referred to as the unit normal distribution. 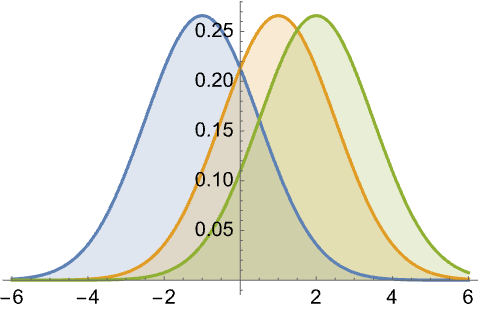 Normal distributions are among the most widely occurring probability distributions and thus have many applications. For example, normally distributed values are of fundamental importance in applications of the Monte Carlo method. In addition, the normal distribution is also fundamental in defining the so-called Wiener process, a continuous-time stochastic process consisting of independent increments , each of which is independent and identically normally distributed with and for . Moreover, a number of probabilistic and statistical values including percentile ranks and - and -scores are derived from normal distributions. Furthermore, because of the central limit theorem, the mean of a sufficiently large number of independent random variables will be approximately normally distributed provided certain hypotheses are satisfied, regardless of the original distributions describing the variables. The normal distribution also arises naturally when modeling a number of physical phenomena, such as the velocity of ideal gas molecules, the positions of particles experiencing diffusion, and the long-timescale behavior of thermal light. In addition, a large number of biological phenomena, including sizes of living tissue and quantities such as fasting blood glucose level and blood pressure, yield variables whose logarithms tend to be normally distributed. RandomVariate can be used to give one or more machine- or arbitrary-precision (the latter via the WorkingPrecision option) pseudorandom variates from a normal distribution. Distributed[x,NormalDistribution[μ,σ]], written more concisely as xNormalDistribution[μ,σ], can be used to assert that a random variable x is distributed according to a normal distribution. Such an assertion can then be used in functions such as Probability, NProbability, Expectation, and NExpectation. 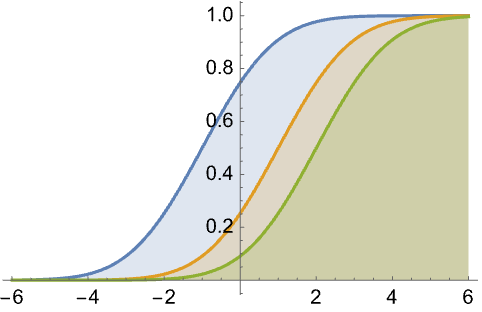 The probability density and cumulative distribution functions may be given using PDF[NormalDistribution[μ,σ],x] and CDF[NormalDistribution[μ,σ],x]. The mean, median, variance, raw moments, and central moments may be computed using Mean, Median, Variance, Moment, and CentralMoment, respectively. DistributionFitTest can be used to test if a given dataset is consistent with a normal distribution, EstimatedDistribution to estimate a normal parametric distribution from given data, and FindDistributionParameters to fit data to a normal distribution. ProbabilityPlot can be used to generate a plot of the CDF of given data against the CDF of a symbolic normal distribution, and QuantilePlot to generate a plot of the quantiles of given data against the quantiles of a symbolic normal distribution. TransformedDistribution can be used to represent a transformed normal distribution, CensoredDistribution to represent the distribution of values censored between upper and lower values, and TruncatedDistribution to represent the distribution of values truncated between upper and lower values. CopulaDistribution can be used to build higher-dimensional distributions that contain a normal distribution, and ProductDistribution can be used to compute a joint distribution with independent component distributions involving normal distributions. 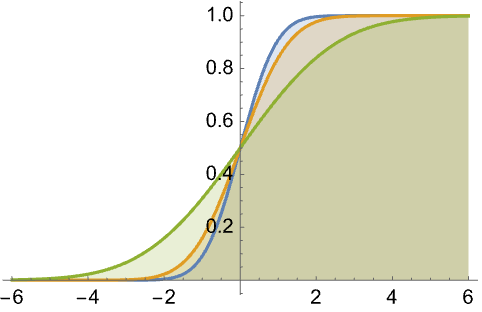 NormalDistribution is closely related to a number of other distributions. A number of distributions, including LogNormalDistribution, HalfNormalDistribution, NoncentralChiSquareDistribution, and LevyDistribution, can be viewed as transformed versions of NormalDistribution, while NormalDistribution can also be considered a limiting case of a number of distributions, including HyperbolicDistribution, StudentTDistribution, PoissonDistribution, and BinomialDistribution. In addition, NormalDistribution is a special case of ExponentialPowerDistribution (PDF[NormalDistribution[μ,σ],x] is the same as PDF[ExponentialPowerDistribution[2,μ,σ],x]), SkewNormalDistribution (PDF[NormalDistribution[μ,σ],x] is the same as PDF[SkewNormalDistribution[μ,σ,0],x]), and PearsonDistribution (PDF[NormalDistribution[μ,σ],x] is the same as PDF[PearsonDistribution[3,σ-2,-μ σ-2,0,0,1],x] when σ>0) and is the marginal distribution of BinormalDistribution and MultinormalDistribution. NormalDistribution is also closely related to StableDistribution, RiceDistribution, RayleighDistribution, MaxwellDistribution, LevyDistribution, LaplaceDistribution, JohnsonDistribution, ChiDistribution, and ChiSquareDistribution.